After the version in cypress wood and after that in iroko wood, both with the wooden baseboard, today I show you the version with the base in carbon fiber. With this improve you could save 1,5 cm in thickness, and have a camera with a truly modern look while maintaining all the features of stenopeika cameras, stiffness, separate and independent movements, zero mechanical on all movements, comfort of use. I finally managed to publish a video about the legendary StenopeiKa 810se2 folding camera, the first completely magnetic camera in the StenopeiKa line. So in the video you could see the features and the movements of the camera, i hope you like it. Today very super special video! The preview of the new 4×5 folding camera… the X camera 4×5″!!! 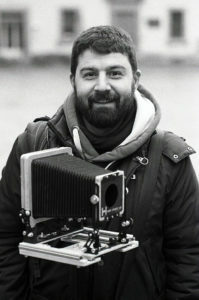 I went to Brussels to meet the professional collodionist Silvano Magnone and try together the new camera (with wetplate holder) to receive some feedback. With us, Elize, the assistant of Silvano, became available at a small shooting. Designed for professional use, it has an aluminum base board, separate and independent movements with mechanical zeroes. After a week of vacation in which I have not published any content, here we are with a new video! 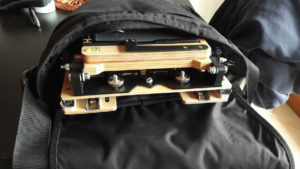 This time, after many requests and comments, I will show you in detail the operation of the back of the StenopeiKa 45se2 folding camera and how it can be used with classic film holders and also for a “special” holders or graflock holders (in the case of video with a polaroid back 504). With this video we are at 3 for what concerns the model StenopeiKa 45se2 folding camera, I remind you a professional, magnetic view camera, with everyone, but all of them, the movements (and very large) both from front and back. Below are the two previous videos. Thanks to the invitation of Giorgio Bordin I was able to bring some cameras to Parma for the wet collodion workshop, a small video was born I hope you like it. Today i’ll show you your definitively affordable camera: Hyper camera 4×5 advanced full optional. Hyper camera 4×5 advanced full optional is the perfect choice. Today I’ll show you the accessory that differentiates the advanced model (presented last week) from the Advanced full optional model that I present today: the graflock roll film holder back. With this back you can also use the roll film holders back (size 120), and turn a affordable camera into a truly complete camera that meets the expectations of the most demanding photographers. As you will see in the video the glass frame is easily replaceable with a roll film holders. Also today other great news! I’ve just finished the advanced version of Hyper camera 4×5 the first affordable 4×5 camera by StenopeiKa. Why this version? Because after many request I decided to implement some features of high-level cameras on the basic to meet even the most demanding users. 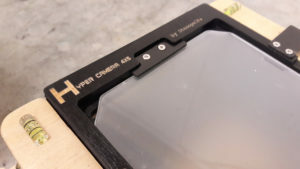 So for that reasons on the Hyper camera 4×5 advanced you’ll find a professional focus ground glass with printed grid (on basic version you’ll find a satin glass without grid) and the comfortable fine focus system under the focus ground glass like every StenopeiKa’s cameras. I made this decision because for me, on a professional camera, it is essential to be able to focus with one hand and with the other to use at the same time the loupe 8 or 10x viewer on the screen. Other difference with the basic version is the color, on the basic the color is only natural wood, on the advanced only black. These additions raise the price to reasonable € 447, but you have a camera that has nothing to envy to some on the market that cost almost double. In the video you could see also other accessory, the advanced back, i’m preparing a video specific for this accessory, practically, I immediately anticipate what it is, it is the usual back that I mount on the StenopeiKa 45se2 folding camera professional that allows you to also use graflock holders, I’ll be more precise next week. P.S. last Sunday, while I was recording the video on the Hyper camera 4×5 basic, I was approached by a gentleman who says he knows me and takes me a picture with a film, with a Nikon … oh well, I forgive him 🙂 Thanks Mirko. You read correctly, today I show you the new Hyper Camera 4×5″, the new affordable 4×5 folding camera the first of StenopeiKa brand. 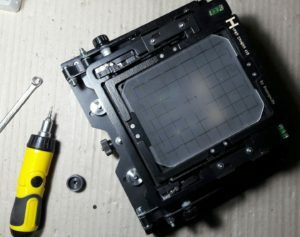 In the video you could see the design of new camera with the base board in the shape of the letter H from which the name “Hyper” is inspired. his reason I designed this camera from “white paper” and thinking with the mind of the people approaching the large format for the first time, so I focused everything on lightness, transportability and cost. The result is the camera into the video, price 297€ (+ vat), weight 1.3 kg, 22 x 22 x 6.5 cm when the camera is close, It is sufficient to transport abag of Eastpack (where I put my ipad), incredible. In addition to this there are other details that make it particularly appreciable, such as the 4 ball levels, the possibility to change the classic bellows with a bag bellows through the magnetic system for years on StenopeiKa’s cameras. Today other video “tutorial” about the assembly of 4×5 camera. For this video I chose my favorite camera, the StenopeiKa 45se2 folding camera, I like it because it is a complete and complex camera and in a certain way reminds me when I started shooting with the Sinar f2, attention I did not say that it is a Sinar f2, I was inspired especially for the separate and independent movements (both front and back standard), mechanical zero positions and rigidity. Obviously then I modeled the project to incorporate these features, suitable for a very professional audience, in a folding. For all these reasons I decided to shoot the video of the assembly with this camera, I hope you enjoy it. This camera configuration is dedicated to my friend Isabel.